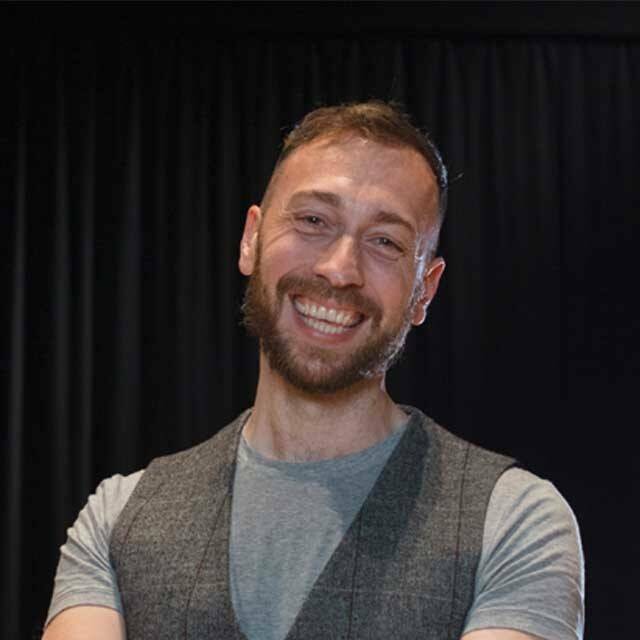 In 2004 Lee completed the first joint practice-as-research PhD to be undertaken within a UK arts discipline with his research partner Joanne ‘Bob’ Whalley. As part of that project they began to reflect upon the process of creative collaboration and knowledge production by drawing on the ‘two-fold thinking’ of Deleuze and Guattari. These processes remain central to their ongoing work together. Alongside their creative practice, they both work in the UK university sector. Their current research includes an exploration of Buddhist, Vedantic and Taoist philosophies, with particular attention being paid to the concept of witnessing. Having spent too many years inside their heads, they have noticed they have bodies, and as a consequence Bob is now an acupuncturist, and Lee teaches yoga. They have published extensively on practice-as-research, and they have recently completed Between Us: Audiences, Affect and the In-Between for Palgrave Macmillan. (Link to personal web site: www.dogshelf.com). A Sort of Tale of Two-ness (2013) performance installation, in Here's to another 10, one-day exhibition, curated by LOW PROFILE and commissioned by the Institute of ContemporaryInterdisciplinary Arts, University of Bath, 20 April, with Bob Whalley . Into the good night(go) (2012) duration week long performance installation,presented as part of the CuratingKnowledge programme at MMU/Axis Arts Centre, OpenSpace Gallery, ManchesterMetropolitan University, 5 – 16 November, with Bob Whalley . And Then There Were Two (2012) performance, Textually Active event , PlymouthCollege of Art Gallery, performed and presented with Bob Whalley, 22 February. Twenty minutes tohide a city (2011) sonic work with Bob Whaley,commissioned by Booth: A Dance Fair, Bloomberg Gallery, 25 November. Artists in Residence (2011 to date) with Bob Whalley,Totnes Railway Station, Devon. Choreographicsupport (2011) at The Place London, with Bob Whalley, for dancer/choreographersSimon Ellis and Colin Poole’s company ‘Colin, Simon and I’, for their touringperformance of Because We Care, April– July. That Infrathing: Part I (2010) commissioned performance at The Place, London,part of ‘Dance and Spectacle’ conference for the Society of Dance HistoryScholars, co-created with Bob Whalley, 10 July. Partly Cloudy, Chanceof Rain (2008) film documentation of PaR event, showedat the Mis-Information Office, Wrights & Sites, Belluard BollwerkInternational Festival, Switzerland, co-created with Bob Whalley , 25June. Another Little Hole (2007) site-specificperformance event in Hazard Festival / ManchesterInternational Festival, performed and co-created with Bob Whalley , 12 July. Re: Incident On and Off (2006) three-day site-specific performance event,Liverpool Biennial Festival of Contemporary Art, co-creator, 26-29 October. Wider Than a Mile (2005) durational film, Trafford Centre ShoppingCentre, Manchester, co-creator with Bob Whalley, 1-30 December. Mettle (2005) devised performance, IshamStudios, The University of Northampton, co-creator/performer with Bob Whalley,14 December. Re-Commit to Memory: Replacing Site (in which Bob andLee spend twelve hours at a loss) (2005) durational devised performative paper,PARIP International Conference, co-creator/performerwith Bob Whalley, 29 June - 03 July. Mettle (work in progress) (2004) devisedperformance, Green Room, Manchester, co-creator/performer with Bob Whalley, 1 October. We Will Remember You (2004) web-based project, availableonline: www.dogshelf.com/wwry.html,co-creator with Bob Whalley, launched May. Commit to Memory (2004) durational performance event, 291Gallery, London, co-creator/performer with Bob Whalley, 25 March. Partly Cloudy, Chance of Rain (2002) site-specific durational performance event, Roadchef Service Station, M6 Motorway, co-creator/performerwith Bob Whalley, 20 September. ‘Hobbyists’ (2014) in DIY (Do. It. Yourself), edited by Robert Jude Daniels, co-authored with Bob Whalley, Chichester: University ofChichester, pp. 52-55. ‘A Sort of Tale of Two-ness’(2013) in Here's to another 10,edited by LOW PROFILE, co-authoredwith Bob Whalley, published by Institute of ContemporaryInterdisciplinary Arts (ICIA) & Cornwall Autonomous Zone (CAZ), April, pp. 17-21. ‘Performanceas Research’ (2011) in ResearchMethods in Theatre and Performance, edited by Prof. Baz Kershaw and HelenNicholson, case study co-authored with BobWhalley, Research Methods for the Arts and Humanities series, Edinburgh:Edinburgh University Press, pp. 69-73. ‘FromStructuralism to Poststructuralism' (2011) in Research Methods in the Social Sciences, second edition, edited byBridget Somekh and Cathy Lewin, chapter co-authored with Prof. Ian Stronach andBob Whalley, London: SagePublications, pp. 310-317. ‘Transcendence and the Everyday’ (2010) catalogue essayco-authored with Bob Whalley forsolo exhibition by performance artist Eunhye Hwang, Reutlingen, Germany, pp.6-7. ‘PartlyCloudy, Chance of Rain: A Case Study’ (2010) in Blood, Sweat and Theory: Research through Practice in Performance,edited by John Freeman, case study co-authored with Bob Whalley, London: Middlesex University Press, pp. 218-233. ‘Disorderly Looking’ (2010) catalogue essay co-authored withBob Whalley for MarinaAbramović, Ivan Civic, Amanda Coogan, Nico Vascellari, Marie Cool and FabioBalducci, Nikhil Chopra, Yingmei Duan, Eunhye Hwang, Alistair McLennan, KiraO’Reilly, Melati Suryodarmo, Jamie Isenstien, Fedor Pavlov-Andreevich, andTerence Koh in Marina Abramović and the Future of Performance Art, ed.Paula Orrell, London: Prestel, pp. 94-99. (Re)Commit To Memory:In Which Bob and Lee Spend 12 Hours At A Loss (2009)catalogue entry co-authored with BobWhalley, in Practice-as-Research:In Performance and Screen, edited by Ludivine Fuschini, Simon Jones, BazKershaw and Angela Piccini, Basingstoke: Palgrave Macmillan, p. 230. ‘From Structuralism toPoststructuralism' (2004) in ResearchMethods in the Social Sciences, edited by BridgetSomekh and Cathy Lewin, chapter co-authored with Prof. Ian Stronach (LJM) and Bob Whalley (Falmouth), London: Sage Publications, pp. 310-317. ‘Zombie Taxonomy’ (2014) Zombies and Performancespecial issue, Studies in Theatre & Performance,forthcoming. ‘Experiencing 'an opening'’ (2013) IndianTheatre special issue: The Body, edited by Sreenath Nair, co-authored peer-reviewed journal articlewith Bob Whalley, in Studies inSouth Asian Film and Media, Intellect Books, Vol. 5.1, November, pp. 56-67. ‘Look Right Through:intention and accident in performer/audience training’ (2013) co-authoredpeer-reviewed journal article with BobWhalley, Theatre, Dance andPerformance Training, 4:1, pp. 102-112. ‘Away From Home: TheCurious Domain of Passage’ (2007) co-authored peer-reviewed article with LeeMiller in Performance Research 12.2‘On The Road’, pp. 66-74. ‘Performance Anxiety: or how Istopped worrying and learnt to love site-specific performance installation’(2007) co-authored peer-reviewed journal article with Bob Whalley in Research in Drama Education,special edition ‘On Site and Place’: 104-107. ‘A Dwelling in the Screen: At leastfor a little while’ (2006) co-authored peer-reviewed journalarticle with Bob Whalley in PerformanceResearch 10.4 ‘On Techne’: 138-147. ‘Zombies:The Yogic Ideal’ (2014) generalpanel paper at IFTR Warwick University, 29th July. ‘On Space’ (2014) research seminar forinterdisciplinary MFAs, Falmouth University, 5 March. ‘Performance Alchemy: Disappearance and Affect inPerformance (2014) research paper, Plymouth University, co-authored andpresented with Bob Whalley, 23 January. ‘Ms Forbes and theGrey Man: Alchemy and Affect in Performance’ (2013) research seminar, Plymouth University,co-authored and presented with Bob Whalley, 21 November.. Introductory talk (2013) talk before film showing of Marina Abramović: The Artist Is Present, Jill Craigie Cinema, Roland Levinsky Building,Plymouth University, co-authored and presented with Bob Whalley, 22 April. ‘Zombie Taxonomy’ (2013) research paper, Zombies: Walking, Eating and Performance,symposium, Plymouth University, 13 April. ‘Into the good night (go)’ (2013) research paper, The Impact ofPerformance as Research colloquium, hosted by CARPA (Colloquium on Artistic Research in PerformingArts), Theatre Academy Helsinki, Finland, co-authored and presented with Bob Whalley, 1March. ‘Playing (un)dead’ (2012) paper, ZDay: Zombie symposium, Battle Library, Reading, co-authored and presentedwith Lee Miller, 24 November. ‘Into the good night (go): Collaborative Methodologies’(2012) public seminar, presented as part of the Curating Knowledge programme at MMU/Axis Arts Centre, OpenSpaceGallery, Manchester Metropolitan University, co-authored and presented with Bob Whalley,7 November. ‘Collaborative Methodologies: Bob and Lee’ (2012)research paper, Methodologies session for Research Students, Falmouth University, 28 September. Introductionand talk to film showing of MarinaAbramović: The Artist Is Present (2012) at Jill Craigie Cinema Plymouth, co-authored and presented withBob Whalley,22 April. ‘Conjecture/Contexture’(2012) research seminar, PlymouthUniversity, co-authored and presented with Bob Whalley, 23 February. ‘Contexture:A Performance Paper on Collaborative Practice as Research’ (2011) Practiceas Research Consortium North West (PARC NW) Carnival, 6-7 July, MIRIADDesign Research Centre, Manchester Metropolitan University, co-authored andpresented keynote paper with Bob Whalley, 6 July. ‘ResidentEvil: The Domestic Dark-half’ (2011) research seminar and durational performance, Drakes Circusshopping mall, Plymouth, co-authored and presented with Bob Whalley, 24February. ‘Hunching and Lunching (or a feeling in one’s bones)’ (2010) research seminar series, Falmouth University, organisation and participation,17 November – 8 December. ‘Strategies for Survival’ (2010) postgraduate PaR intensive,Plymouth University, 16 – 17 October. ‘There may bequestions arising’ (2010) postgraduate research event, University ofRoehampton, co-authored and presented with Bob Whalley, 11 October. ‘ThatInfrathing: Part II’ (2010) artist discussion at The Place, London, Dance and Spectacle conference for theSociety of Dance History Scholars, co-authored and presented with Bob Whalley,10 July. ‘ThePigs of Today are the Hams of Tomorrow’ (2010) documentation of The Pigs of Today are the Hams of Tomorrowsymposium and performances and exhibition in conjunction with Marina Abramović,organisation and participation, Royal William Yard, Plymouth, 21 - 24 January. ‘Open ForumConversations and Discussions’ (2010) ‘Live Laboratory Symposium’, in The Pigs of Today are the Hams of Tomorrow,in conjunction with Marina Abramović, presented with Bob Whalley and Gillian Wilde,Royal William Yard, Plymouth, 23 January. ‘From the First to the Last: Pedagogicstrategies for the development of durational site-based performance practice’(2010) Calculating Risk: assessment, ethics and risk assessment indurational and site-based performance work with/by students, PALATINEsymposium, keynote paper, Plymouth University, 21 January. ‘Not Going Out, Not Stopping In: lassitude, inertiaand practice-led research’ (2009) research seminar, Plymouth University,co-authored and presented with Lee Miller, 19 November. ‘Not Going Out’ (2009) research seminar, BrunelUniversity, co-authored and presented with Bob Whalley, 18 November. ‘Dissent and Domesticity’ (2009) artists’ talk, The Choreodrome Lecture Series, ThePlace, London, co-authored and presented with Bob Whalley, 13 August. ‘Not Going Out: Dissent and Cupcakes’ (2009) research paper, Falmouth University, Dartington Campus, co-authored and presentedperformance paper with Bob Whalley, 29 April. ‘The Hobbyist At Home’ (2009) research paper,University of Surrey, co-authored and presented performance paper with BobWhalley, 6 March. ‘How do you hide a city? A performed paper, one thatmight, quite possibly, involve workshop elements as we all try to find the bestway*’ * The best way to hide a city, that is (2008) The Hidden City Symposium: Mythogeography, Writing, & SiteSpecific Performance, Plymouth University, co-authored and presentedkeynote paper with Bob Whalley, 4 October. ‘hopes, aspirations and fears’ (2008) position paper,Falmouth University, Tremough Campus, 11 April. ‘Playingwith the inside/outside of site-specific' (2007) research symposium, Central School of Speech and Drama, co-authored and presentedperformance paper with Bob Whalley, 6 November. ‘All The Places We’ve Never Been, All The Things We’veNever Seen’ (2007) artist conversations alongside solo galley exhibition,Alsager Arts Centre, with Manchester Metropolitan University, Alsager,co-presented with Bob Whalley, 25September. 'Re: Incident On& Off - The Inside/Outside Of The Site-Specific' (2007) researchsymposium, The University of Northampton, co-authored and presented performancepaper with Bob Whalley, 21 February. ‘Revealing and concealing thein/visible-un/thinkable: Collaborative performance research (in the work) andcollaborative performance research environments (for the work)’ (2006) WorkingGroup on Performance as Research, International Federation for TheatreResearch/Fédération internationale pour la recherche théâtrale, World Congress, University of Helsinki,Finland, co-authored and presented paper with Bob Whalley, 7-12 August. ‘Re-Commit to Memory: Replacing Site(in which Bob and Lee spend twelve hours at a loss)’ (2005) PARIP International Conference, co-authoredand presented paper with Bob Whalley, 29 June-3 July. ‘We Will Remember You’ (2004) Dramatic Learning Spaces InternationalConference, University of KwaZulu-Natal, Pietermaritzburg, South Africa, co-authored and presented paper with Bob Whalley, 23-25 April. ‘Halfway To the Bottom’ (2004) PARIPMidlands Group meeting, The University of Northampton, co-authored andpresented paper with Bob Whalley, 28 February. ‘We Will Re-RememberYou’ (2003) PARIP National Conference, Bristol University, co-authored and presented paperwith Bob Whalley, 11-14 September. ‘You Can’t Get There From Here’(2001) Towards and Beyond, StandingConference on Drama in Higher Education, Annual Conference, University ofExeter, co-authored and presented paper with Bob Whalley, 6-8 April. ‘Document of a Performance Yet toTake Place’ (2000) Intensities Symposium,Manchester Metropolitan University, co-authored and presented paper with BobWhalley, 30 September. Can Collaborative Practice Really Make a PhD? (2006), invited speaker, postgraduate supervisor training course, The University of Northampton, 30 November. Co-authored and presented Joanne Whalley and Lee Miller. Notes on Collaborative Practice as Research (2006), invited speaker, staff research seminar, The University of Northampton, 12 January. Co-authored and presented Joanne Whalley and Lee Miller. ‘Taking the Piss’: Progressive Research Methods (2005), invited speaker, postgraduate supervisor training course, The University of Northampton, 12 December. Co-authored and presented Joanne Whalley and Lee Miller. Collaborative Practices (2005), invited speaker, postgraduate Fine Arts lecture, The University of Northampton, 9 May. Co-authored and presented Joanne Whalley and Lee Miller. Sucking Eggs: Operational Knowledge and Practice as Research (2004), invited speaker, staff research seminar, DeMontfort University, 1 December. Co-authored and presented Joanne Whalley and Lee Miller. You Can’t Get There From Here: Progressive Research Methods (2002), invited speaker, postgraduate research seminar, Manchester Metropolitan University, 5 September. Co-authored and presented Joanne Whalley and Lee Miller.